Dropzone giveaway! Win a key for the closed beta of this competitive RTS! Dropzone, a competitive RTS, has just entered it’s closed beta, and we’ve been given a bunch of keys to get some of you lovely lot into the action. 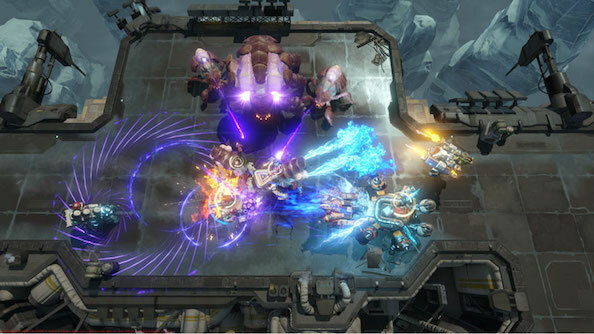 Combining the most popular features of RTS games and uber-popular MOBA’s, Dropzone is a 1v1, arena based strategy game where players choose a team of three pilots from various familiar classes such as tank, gunner and support, with players then creating a fully customisable ‘rig’ for the pilots to take into battle. Matches last 15 minutes and are the objectives are much simpler than the heavyweight MOBA’s; matches are decided by whoever has the most points, with points being accumulated by destroying alien hives that are present on the map, and transporting their cores to the centre of the map. The maps in Dropzone are fairly small, making map awareness and mastering the ability to control three separate units at once crucial for victory. We’ve got 500 keys to get into the closed beta of Dropzone to give away, and all you need to do for a chance to win is enter via our widget below. We’ll also need your email, but not for anything fishy – we just need a way to contact you should you win a key! If you like our giveaways, don’t forget to drop us a Like on our Facebook to stay up to date with all our future giveaways.